SUDC is the Sudden Unexplained Death in Childhood. In this blog we share our experience of trying to cope with our precious son Patrick's death on January 25th 2011 and how it has impacted our lives. It is a year of big birthdays all around in the extended family and friends. We have 30th, 40th, 50th, 70th and should be having a 10th. On April 5th, Patrick would be turning 10. As we have done for the past 8 years, it will be us blowing out the candle on a cake he will not be able to taste himself. 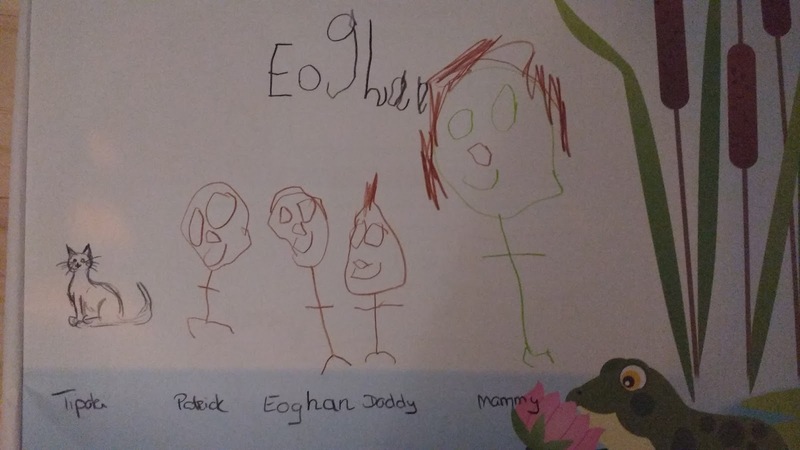 In honour and in memory of his older brother, Eoghan will be walking the 10km stretch of the Great Limerick Run with me this year. 1km for each one of the 10 years that will have passed since Patrick was born. This year, we dedicate the Stroll For Sproggy to the The Children's Grief Centre, a Limerick based charity that offers support for children and teenagers who experience grief through death, separation or divorce. We feel it is a hugely important and worthwhile service as children's grief can often be overlooked while at the same time being quite complex. Children sometimes need help in learning to navigate their feelings surrounding their grief and receiving compassionate one on one support can be of immeasurable help to them. Eoghan's sense of loss must feel quite strange to him as he is grieving for something and someone he never had in his life. He feels genuine upset and loss for not having his big brother around but at the same time feels genuine love and affection for someone he has never met. How confusing must that be for someone so young. Being only 7, we think he is showing great determination in committing to walking the whole 10km. How challenging it must occasionally be for him to be "the rainbow". He is a little brother with none of the big brother protection, banter and fighting that other kids have. He is an odd kind of middle child. He is a big brother. He is the most amazing big brother our daughter could ever wish for. He will have her back and takes her bossing him around in his stride. I hope we are doing him justice by raising him in a way that is not making him feel like he is existing in the shadow of this person who came before him and who died in such a sudden, unexplained way. That is our challenge. Though we tell him often, I hope one day he reads this and truly realises just how wonderful he is. And I hope we can help him raise some funds for this amazing charity. On January 25th 2011, my husband and I lost our first born and until then only son to SUDC. Sudden Unexplained Death in Childhood. Writing seems to have helped me process some of what is happening to us along this strange road that we never thought we would find ourselves on. After having been blessed with a wonderful rainbow baby shortly after that loss, we have more recently suffered an early miscarriage. All opinions expressed are my own personal opinions and experiences following the death of our darling Patrick and the loss of our little bean. Every persons journey through grief is very different...there is no right or wrong or set timeline...So what I write is my own personal way of trying to make sense of all of this.